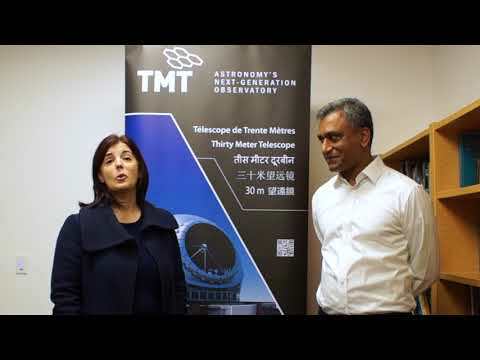 PASADENA, CA – Last month, the Thirty Meter Telescope successfully completed the Test Results Review of the Telescope Tertiary Mirror (M3) Prototype. Chinese Academy of Sciences’ Changchun Institute of Optics, Fine Mechanics and Physics (CIOMP) engineers presented a series of tests on the M3 prototype, which received full approval from the members of the multinational review panel. As a result, CIOMP is now moving into the construction phase of its full-scale tertiary mirror system for TMT. M3 system, also called the Giant Steerable Science Mirror (GSSM), includes a 3.5m by 2.5m flat elliptical mirror, plus the mirror support system and the rigid body positioner that rotates and tilts the mirror so it can track with the telescope. The GSSM, located in the center of the primary mirror, is used to fold and steer the light path coming down from the secondary mirror, so the science beam can be delivered to any of the instruments active on the telescope. GSSM must be able to switch among the various science instruments rapidly and precisely, and keep the beam aligned with the instrument as the telescope changes its elevation angle. The scope of the M3 prototype review included the assembly of the prototype, the assembly steps and the testing realized in laboratory. Among the series of tests conducted were mounted and unmounted mirror surface figures, mass and center of gravity, vibration and resonant frequency, axis alignment, calibration, motion, bonding and finally the mirror cell support accuracy. For the past three years, CIOMP, selected by the TMT project office and by the National Astronomical Observatories of the Chinese Academy of Sciences (NAOC) to supply GSSM, has been designing, fabricating parts, procuring components, assembling and testing the prototype. Many of the tests are similar to the tests that will be done to evaluate the performances of the real-size GSSM for TMT. As a result of the review, the CIOMP team will proceed into the construction phase, where they will start the preliminary design phase for the real full-scale hardware production. Preliminary design, a period of analysis and computer-aided design (CAD) modeling is slated to kick off in March 2017. In the year to come, the mirror fabrication team will review the documentation to procure the M3 mirror blank and will proceed with their plans for fabricating the mirror. The precision mechanical team will perform a preliminary design of the entire GSSM. It is expected that the final GSSM design period, prior to start of fabrication, will take another 18 months. Jerry Nelson (TMT Project Scientist). Zhao Jinyu (Director of Precision Mechanics).